We are located at Bay Road,Westmoreland. ( just 15 Minutes from Negril ) The property is on the south-west coast, and has a very picturesque view of the sunset. The property offers a family type setting with a long driveway decorated with a variety of palm trees, a huge lawn, many species of beatuful flowers, coconut trees, and an abundance of fruit trees. The trees are mostly labeled to assist visitors to identify some names of trees that they might have been introduced to in Jamaica, as well as being part of the regular visitor tours. 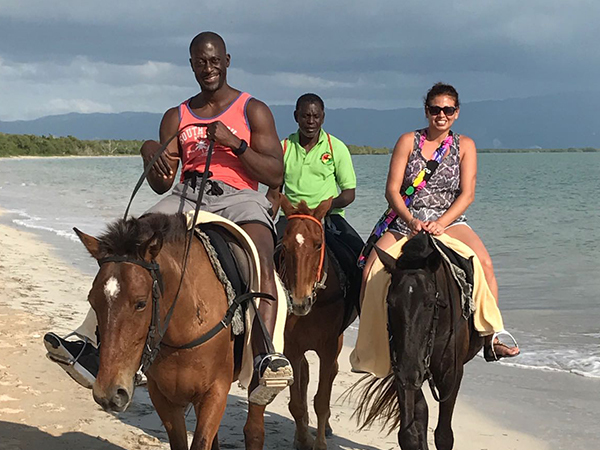 The staff includes tour guides for horseback riding, nature walk tours, fun fishing, horse & carriage services and bird watching tours. We are known for our elegant horse drawn carriages the only carriages of its kind in jamaica. At our location we can host birthday parties, weddings, corporate retreats and with our network of friends on the island we can coordinate everything for you including wedding planning. We are locally owned and operated which gives us great flexibility and allows for special services when needed.